St. Isidore (c.560-636), bishop of Seville was a prolific writer, perhaps his most famous work being the encyclopaedic 'Etymologies'. His 'Sentences' are a compilation of theological excerpts, arranged in three books, drawn mostly from St. Gregory the Great and St. Augustine. An inscription on a flyleaf suggests that this manuscript was perhaps owned during the Middle Ages by the Franciscan convent in Bristol. 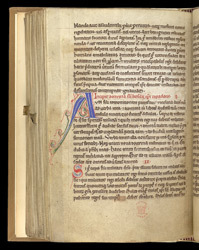 This initial introduces a treatise attributed to St. Basil, Bishop of Cappadocia.